Cupcakes 'n Daisies: It's Party Time . . . . . . 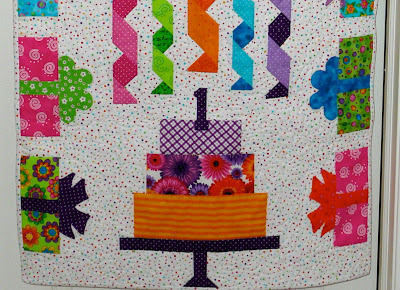 Here's Block #2 for the Jelly Roll Sampler Quilt Along sponsored by Moose on the Porch. I would give this block a "C". There's so much going on that nothing pops, plus one set of stripes is horizontally challenged. I should have used the same smaller dot fabric that I used in block one. 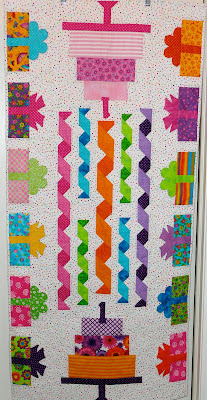 I did piece this block on a dreary and rainy day, so even though it's not as good as it can be, it still cheered me up just to play with the bright fabric. Here's block one and two, side by side. I definitely nailed bright. Oh well, not every block can be my favorite. I made this table runner for a friend's granddaughter's first birthday. My first and only table runner.....I think....no really, this is the only table runner I've made, but how could I forget it, I still really like it! The pattern is "Party Time Table Runner" by From Me to You, an original pattern by Diana McClun and Laura Nownes. 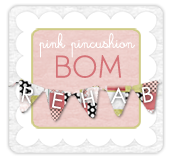 Check out their blog for other wonderful patterns and books, they also design Mystery Quilt Pattern Programs. If you compare their pattern to my runner, you'll notice I made a few changes. The pattern makes a runner 26" x 74", I made mine 28" x 58" and after it was done, I think I would have liked it even shorter. I replaced the patchwork blocks in the center with streamers. I dropped the "donuts" on each end and added a layer to my layer cakes. AND I added a "1" candle. After I finished the table runner and gave it to the birthday girl, it dawned on me that instead of appliqueing the number one on each cake, I should have attached a piece of velcro and made a set of numbers that could be changed for each birthday. I will do that on the next one for sure. Ok so WOW to that table runner. Seriously very cool. And I like your version way better then the pattern. I think your block is perfect for a child's quilt. It is so happy and kids don't look for focal points etc. They like loud, happy fabrics and your blocks are full of them. What a cute cupcake tag! And your table runner is adorable! I love the idea of velcro numbers~ wouldn't that be a wonderful gift for a new Mom who already has every baby item imaginable? :-) Thanks for the idea! :-)) I like your blocks too~ they are perfect for a child! Have a happy day Thelma! I love your tablerunner and the project with the leftover bright Lakehouse fabrics is going to be really fun and cheerful. I love Lakehouse fabrics - they are such good quality. I had to laugh about you forgetting to log your tablerunner. I was going over my finished projects list (which I didn't start keeping until I started blogging - 12 years after I started quilting!) and realized I never added tablerunners or small swap quilts. Oh well. Your cupcake tag is adorable! oh love that table runner. I should make one of these for the family. I like your modified version even better. The brights are great! I'm loving your blocks - a child is going to love that quilt to pieces! The tablerunner is beautiful, Thelma. 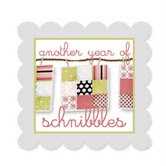 I signed up for the jellyroll sampler too and like you, I'm using scraps. i totally agree with you on block 2: nothing really pops up and I tried several fabrics and contrasts. Ah well, we'll see what the 3rth block will look like. Like your colours on the block ánd the tablerunner!! Oh Thelma that table runner is the cutest...love it! I really like your Jelly Roll block...it will make a child very, very happy! Thelma, I like both of your Jelly Roll quilt a long blocks. They will be perfect for a child's quilt. How adorable is that table runner?!?!!??!!! So fun for a child's birthday. Great idea (for next time) to use Velcro for the number. 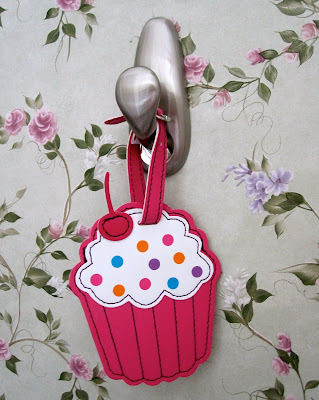 Love your cupcake luggage tag! I love the table runner ... just adorable! 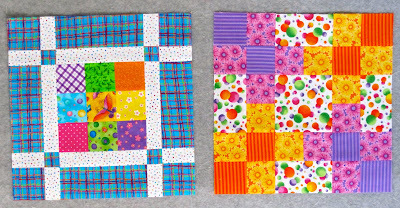 The blocks will be perfect for a childs quilt. I want to do these blocks (I have printed the instructions) one day ... maybe after the wedding. Your luggage tag is adorable! Such pretty, happy colors! You've chosen great quilt along pieces! The luggage tag is perfect for you! I love the table runner and the changes you made were spot on. Love it! It truly is wonderful. You're right - you nailed bright! Kids love bright and happy! So do I! That's a super cool table runner! Didn't you make ME a table runner that's in my bedroom? I like your version of the table runner best. How did you make the streamers? They are quarter triangle squares, you need a light and dark of the same print to get the effect.